Walther is an arms maker that needs no introduction for most people. Even the gun-averse can name their most iconic product, the Walther PPK, legendary handgun of Bond, James Bond. But Walther has been more than a one-trick supplier of compact pistols to fictional English secret agents. The firm of Carl Walther GmbH has been cranking out firearms for over 100 years, from before the turn of the 20th century, through the tumult and tragedy of the Second World War all the way through today. 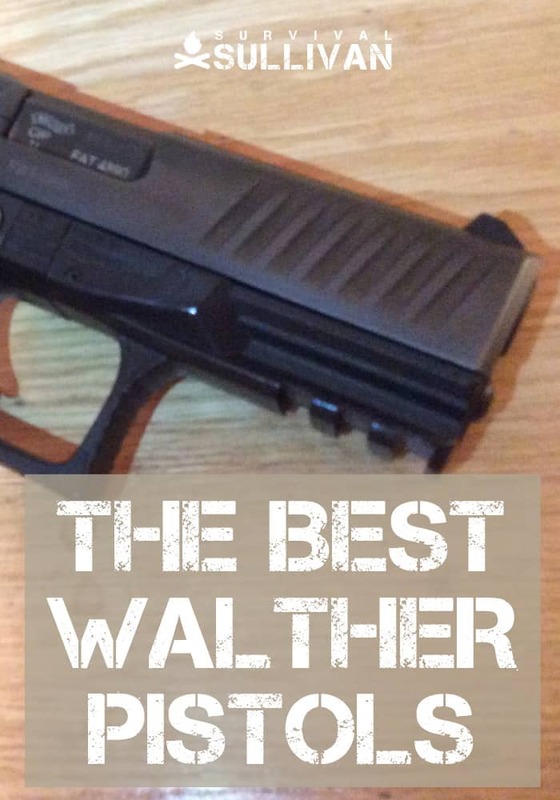 Walther has long stood for refinement, excellence in manufacturing and dependability with a reputation for accuracy. Walther’s long legacy has turned out rifles, submachine guns and handguns, the latter being the product they are most famous for. Walther has given their handguns special attention since the introduction of the Model 1 way, way back in 1908, always paying attention to the needs of users who desired compact, easy to carry pistols or fullsize handguns suitable for the battlefield like the groundbreaking P38. That ethos continues today, with in-production Walther offerings covering every base from practice, plinking or target shooting to backup guns, concealed carry or service pistols. In today’s article, we will be rounding up a list of Walther’s excellent and famous pistols, past, present and future, with an emphasis on their more modern guns in an effort to give you more to consider when you head into the shop looking for your next defensive piece. The guns on this list are chosen first and foremost for their viability as defensive handguns for civilian use. Not for their target shooting capability, historical significance or other factors. We are looking at “best” not most important or most influential. This means that some pivotally influential designs like the aforementioned P38 will not be on this list, while others like the PP and PPK will be; the PP and its variant PPK and PPK/S are, in my opinion, still viable concealed carry handguns today in their category, warts and all, while the P38 is most decidedly not a great choice among fullsize handguns, even though the German Army used it even into the 21st century. So for any of you Walther die-hards and superfans out there, keep that in mind before you let it rip in the comments. I’m not calling your babies ugly. You cannot discuss Walther without bringing up their most iconic offering. As mentioned above, the PPK was famously used by James Bond both in print and film, though that makes not a lick of difference for our purposes. What is more important to us is the suitability of either of these pistols for concealed carry and defensive use. The PP and its variants the PPK and PPK/S have been around for many decades, and all have imitators across the globe. Originally introduced in 1929, the PP was a pistol of considerable innovation in its time, notably for being one of the first successful DA/SA handguns, and featuring a now familiar combination safety-decocker lever (carried forward to its larger P38 cousin) and an automatic hammer block. The PP, or Polizeipistole (literally Police Pistol) was intended, obviously, for use as a police sidearm, and saw considerable success in that capacity. Chambered in the (to American preferences, anemic) .22LR, .32 ACP or .380 ACP, and holding either 10, 8 or 7 rounds respectively, the PP would be slightly modified into its more famous, and far more common iteration, the PPK, or Polizeipistole Kriminalmodell, or “Detective’s Police Pistol” in 1930. The PPK has all its attributes abbreviated: a shorter barrel, frame, slide and grip. Along with 1 less round in every standard PP chambering. The PPK was easier to carry and conceal than its larger parent, and that, plus a massive bump in popularity from the James Bond franchise, saw it secure its fame and popularity well into the future. The PPK/S is another modification, one resulting from the enactment of the U.S.’s 1968 GCA that sharply regulated imported firearms. The PPK, long an outstanding favorite of America’s commercial market, now no longer qualified for importation due to size and weight restrictions. Not wanting to miss out on that sweet, sweet commercial revenue, Walther, in typically German fashion, simply mated the PPK slide and barrel to the longer PP frame. The result is an in-between size that passed import requirements until the PPK was produced domestically. As concealed carry pistols go, the little PP and PPK series guns are a mixed bag: their layout is generally recognizable and intuitive to shooters even today, pretty good for a pistol designed in the 1920’s and changed virtually not at all since then. They are well balanced, easy to conceal and generally reliable when fed high-quality ammo. Their rounded and blunt profile makes them attractive for IWB carry. The bad news though is in the shooting: all examples are hampered by heavy, stacky, double action pulls and mediocre single action pulls. The slide mounted safety is tricky to actuate without practice, and very challenging for anyone with large hands. An abbreviated tang combined with low bore axis means slide and hammer bite are common. Worse, most examples of these pistols are very finely machined. Too finely, as every metal part, from the underside of the slide to the serrations and edges of the safety are very sharp, and the wenig Walthers draw plenty of blood even in training. The American-made versions, modified by Smith & Wesson, feature some design improvements, like an extended “beaver-tail” tang, dehorning of the sharpest parts and improved trigger pulls but these are still not quite enough to eliminate the bite of these guns. Still, if one desires a highly compact pistol in a smaller caliber, and one that can shoot quite well if you can put in the practice, the PP and PPK series guns remain decent choices today. The P99 was introduced to the world in 1997, a time of much innovation and competition among manufacturers of polymer pistols. This new breed of Walther was designed as a heavy-duty combat handgun for police and military users, chambered in 9mm Para. and the .40 S&W, then law enforcement cartridge of choice in the U.S. The P99 is notable for several innovations that are taken as standard on polymer handguns today, like interchangeable backstraps, and also featured an innovative spin on the trigger for a striker-fired gun. The original P99s as introduced featured what is essentially a DA/SA trigger, what Walther dubbed the Anti-Stress trigger system, novel for its method of operation. When cocked, the first trigger pull would be very long like a traditional double action trigger, but light, something like a two-stage rifle trigger. After breaking the first shot and recycling, the trigger would reset into a much shorter single-action mode. Alternatively, the user could depress the decocker button located on the side of the slide at any point to put the trigger into true double action mode, with a long, heavy first shot before all subsequent shots would be fired in single action mode as above. Aside from the interesting trigger, the P99 is a rugged and reliable handgun, and one that never quite caught on in the U.S. except for sporadic issuance by some police departments. Early guns also had a reputation as being slippery, though later revisions and production variants have corrected this and some other ergonomic quirks. The P99 remains in production for militaries, police forces and civilian purchase around the globe today in a variety of new variants. While not their star pistol anymore, the P99 is a refined and trustworthy firearm, and directly informed much of the engineering of in Walther’s newest polymer pistols. But if you like the assurance of a DA/SA handgun put enjoy the simplicity and reliability of a striker-fired gun, give the P99 a look. 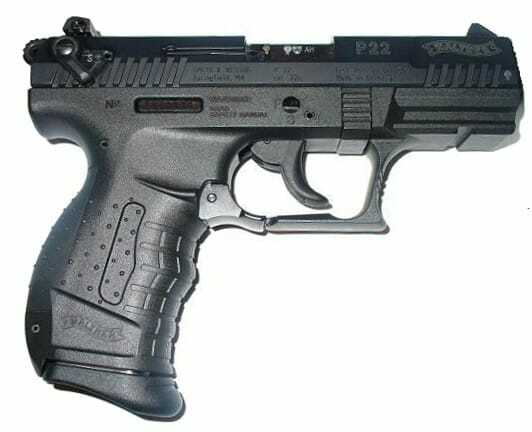 Building on the solid if understated success of the P99, the PPQ is a worthy successor. Available in 9mm, .40 S&W and .45 ACP, and featuring improved ergonomics, aggressive frame texturing, and an excellent stock trigger for a striker-fired pistol, the PPQ only builds upon Walther’s legacy of great polymer pistols. The PPQ shares much of its design lineage with the P99, and some parts, like sights, and backwards compatible. Where the PPQ really departs from its younger stable mate is in its trigger system. 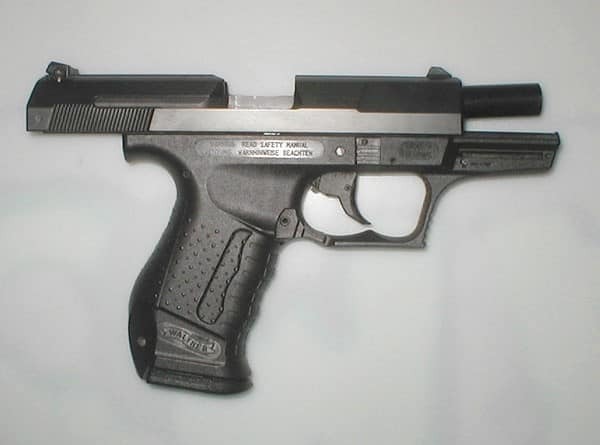 The striker of the PPQ is always fully cocked, not partially cocked as with many other striker-fired handguns. The trigger system, what Walther has dubbed the Quick Defense trigger, is notable for a short, crisp pull and a very short reset. The PPQ features the now standard interchangeable backstrap, ambidextrous controls and Picatinny rail on the dustcover for mounting of accessories. Earlier models featured the newer style European magazine release as popularized by H&K, consisting of a pair of slaved levers on either side of the rear trigger guard. Newer models, denoted by the M2 suffix after the model, feature a conventional button in the typical place on the frame. The PPQ’s are accurate and easy to shoot well thanks to their great triggers. The success of the original has led to the creation of several variants, including long slide competition models, optics-ready slides, and subcompact versions for backup or concealment. Walther’s super slim, super light PPS M2 is a dream gun for concealed carry. Slimmer than just about every other single-stack 9mm on the market, the new M2 variant has many improvements over its earlier iteration such as no rail on the dustcover, an enlarged and more positively operated slide release and a redesigned frame and enhanced texturing for a non-slip grip. The frame in particular lacks the odd interchangeable backstrap which also functioned as locking system: with the backstrap removed, the earlier PPS would not fire. The PPS M2 is not just a joy to carry, but also a joy to shoot, fully exhibiting Walther’s characteristic reliability and accuracy, handling much like a larger gun despite its tiny footprint. Presently available only in 9mm with 6, 7 and 8 shot magazines, the PPS can be had in one of a few current trims, including one with a Crimson Trace Laserguard or another with a MRDS in the premium carry optics package, you will no longer need to choose between performance when it is time to go loud and concealability the rest of the time. Small, thin and shooting like a larger gun, the PPS M2 is an underrated jewel on today’s carry gun market. For users desiring a pistol with a manual safety, the single stack CCP delivers, along with some interesting design elements. Utilizing gas-delayed blowback operation rarely seen in pistols today, and most famously utilized in the H&K P7, the Walther CCP is a soft shooting, affordable pistol for concealed carry and home defense. Sometimes derided for what is seen as a challenging method of disassembly (and in this author’s opinion, highly overblown) the CCP is nonetheless a very solid performer in its price range. Featuring the now distinctive profile of current generation Walther polymer framed handguns, the internals are quite different; instead of Browning-type locking you have a fixed barrel surrounded by its recoil spring, again akin to the H&K P7 or Walther’s own PPK. A manual thumb safety is correctly and ergonomically located at the rear of the frame, and is generously proportioned for fumble-free operation high stress situations. If the CCP has a flaw aside from marginally trickier disassembly, it is shared with all pistols utilizing its method of operation: it gets hot, and quickly! The CCP was never designed nor intended to be used as a proper service handgun, and so mitigating heat from a high number of rounds fired was not high on the list of design priorities. While this can make prolonged practice sessions a mite uncomfortable, or even slow down your training tempo, it is not a practical problem for 99.999% of potential users… Unless of course you plan on getting into multi-hour running gun battles with your concealed carry pistol. Those minor quibbles aside though, there are very few handguns on the market today that will do what the CCP does as well as it does in its price category. Everything old is new again with this slick carry gun. Bursting onto an unsuspecting rimfire market in 2002, the now-classic P22 in .22 LR was a market-shifter when it first appeared. Compared to other, more traditional .22 pistols from other manufacturers, ones that often had little or nothing in common with their larger service caliber siblings, Walther went another way, and a whole host of imitators followed. The P22 was greatly inspired by its larger relatives, featuring a control layout that would be instantly familiar to anyone who had used a P99, only with the addition of a manually operated slide mounted safety. The P22 looks for all the world like larger fighting handgun, only one shrunk down to about half its original size and bulk. With a DA/SA trigger, slide release and magazine release all placed to correspond with the P99, the P22 made for a great trainer or introductory platform, in addition to being a fine little pistol in its own right. Reliable with high-velocity ammo and possessed of surprising resistance to dirt and neglect, the P22 is more than a plinker. Equipped with a silencer on its threaded barrel, the P22 is a great gun for low signature shooting. Easy to load and operate, with its feathery light weight and small form factor, the P22 also makes a fine concealed carry piece for those who cannot or will not use a larger pistol. Walther has earned a place at the table among the world’s foremost manufacturers of handguns. With a history of quality firearms reaching back to the beginning of last century, Walther has showed they are in it for the long haul, and their designs reflect that ethic. While sometimes viewed as a runner-up next to Glock and other European manufacturers like Beretta, F.N. and Heckler and Koch, the truth is that Walther is manufacturer worthy of considerable acclaim. The author is absolutely correct in describing the downside of the PPK/PPKs..! I bought one in 2003 to carry backpacking, it was a stainless steel model. the slide take meat outta my right hand, and the pistol can draw blood cleaning the dam thing on it’s sharply machined areas under the slide. Now a days I’m a Glock man, daily carry is s Glock 19, I also carry in cooler weather a Glock 17. I own a Glock 21, but it’s bulky and heavy to carry concealed. The author is absolutely correct in describing the downside of the PPK/PPKs..! I bought one in 2003 to carry backpacking, it was a stainless steel model. The slide takes meat outta my right hand, and the pistol can draw blood cleaning the dam thing on it’s sharply machined areas under the slide. Now a days I’m a Glock man, daily carry is a Glock 19, I also carry in cooler weather a Glock 17. I own a Glock 21, but it’s bulky and heavy to carry concealed.